Each week on Lucky Dog, Brandon McMillan rescues an untrained, unwanted, "unadoptable" shelter dog. In the days that follow, the dog undergoes a miraculous transformation as it learns to trust McMillan, master his 7 Common Commands, and overcome its behavior problems - ultimately becoming a well-mannered pet or even a service dog. With his labor of love complete, McMillan unites each dog with a forever family. 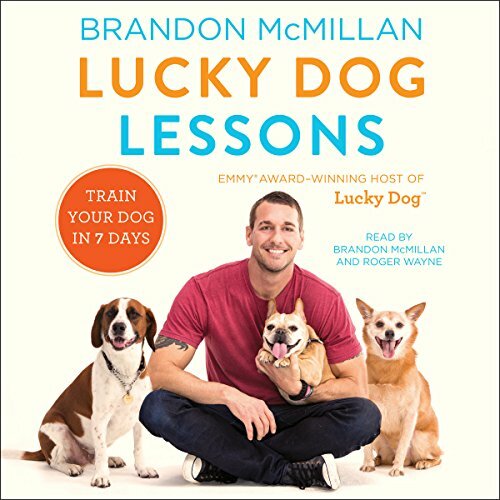 Now, in his first book, McMillan shares the knowledge he has gained working with thousands of dogs of every breed and personality to help listeners turn their own pets into well-trained Lucky Dog graduates. Lucky Dog Lessons begins with the basics - building trust, establishing focus and control, and mastering training techniques. From there McMillan explains his playful, careful, and kind approach to training the 7 Common Commands he teaches every dog: sit, stay, down, come, off, heel, and no. Next McMillan provides solutions to common canine behavior problems, including house training issues, door dashing, chewing, barking, and mealtime misbehaviors. Lucky Dog Lessons includes easy-to-follow steps, illustrative examples, and tried-and-true tips and tricks to demonstrate each technique. Throughout the book McMillan shares inspiring stories about his favorite students and gives fans a behind-the-scenes look at the show and some of his most unique and challenging canine encounters, including some never-before-heard outtakes. The best book whether your dog is a rescue, old young you think you know it all or every dog owner should listen to this book. and our dogs have a better life. This guy is wonderful I wish there were more people like him. I am anxiously waiting for part two. It is perfect for those who have no clue where to start. I loved hearing about Brandon's experiences training all the dogs, I especially love LUCKY DOG. It has so much information that I am listening to it again. I really enjoyed the narration. Very interesting. Great read for any (prospective) dog owner! Excellent easy read for learning how to teach your beloved pet! Much easier than many other methods, and has great examples that help clarify the point of each lesson. A great training tool for dog people. This audio book was a wealth of information for helping me with my goldens. Excellent job Brandon! Excellent, knowledgeable, and enjoyable book! This author has the exact same goals, beliefs and passions about dogs as I do so this was such an enjoyable book to read! Great book. Brandon covers a broad range of training topics in a very concise manner. additionally, He offers a variety of easy to implement instructions. He explains your dogs perspective to expand your understanding of why these methods work. Best of all he keeps it entertaining with experiential stories.